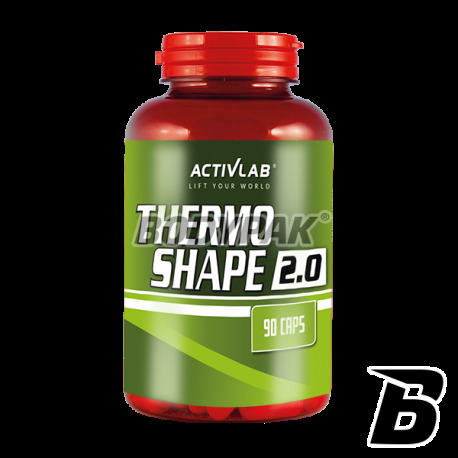 Fat LossActivlab Thermo Shape 2.0 - 90 kaps. This sensational fat burner has been developed for people who want to quickly get rid of unnecessary fat tissue, both actively using physical exercises and comfortable leading a calmer life! 44 loyalty points Your cart will total 44 points that can be converted into a voucher of 1,76 PLN. 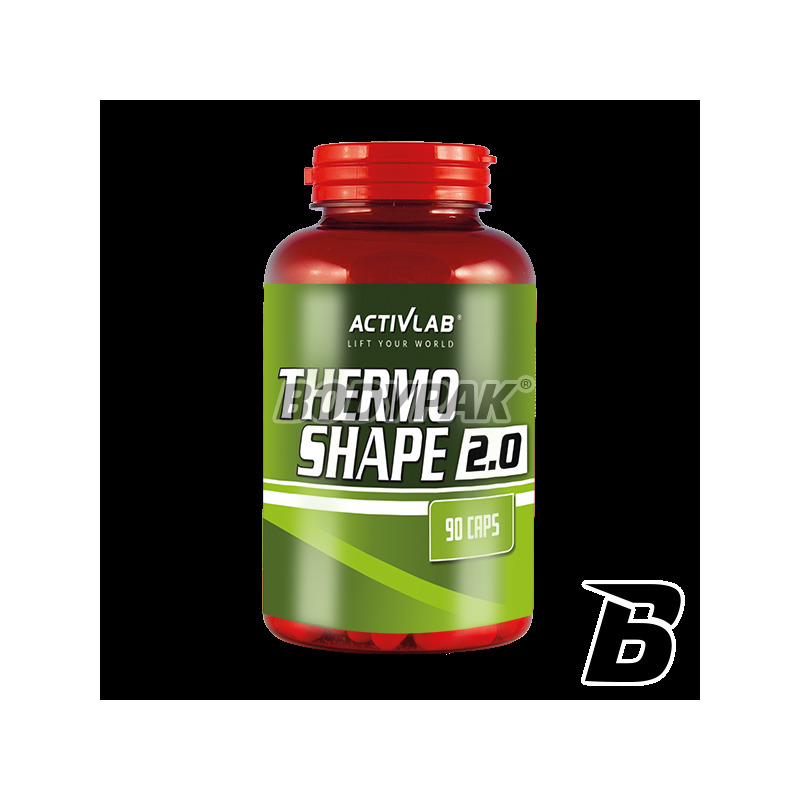 Activlab Thermo Shape 2.0 is a comprehensive dietary supplement containing carefully selected active ingredients, whose aim is to intensity of heat (thermogenesis), accelerate metabolism, faster, get rid of the extracurricular kilos. L-carnitine - plays an important role in the burning of fatty acids in the body. Transports it to the cell cytosol to the mitochondria where they are oxidized (burned). It allows for increased fat burning during aerobic training. The extract of bitter orange - contains active substances accelerate metabolism, reduce appetite and increase the use of fatty acids for energy conversions. Green tea extract -powoduje severity of thermogenesis. The result was that the body is increased fat burning. It also contains EGCG is a powerful antioxidant, 100 times stronger than vitamin C.
Caffeine - has made. The most important effect of its action is to stimulate the psycho, but it also contributes to increased production of energy from fat. Garcinia Cambogia Extract - contains acid HCA, which allows you to reduce the deposition of body fat while preserving muscle tissue. This acid also reduces the appetite! L-Tyrosine - it acts as a stimulant to the nervous system. It improves mental clarity, improves mood, reduces fatigue and stress. Black Pepper - contains ingredients intensifying heat production and the increasing absorption of other active ingredients from the gastrointestinal tract. Cayenne pepper - contains kapsiacynę the increasing thermogenesis. Chromium - effectively reduces appetite. It also helps the body to efficiently metabolize carbohydrates. Ingredients: L-carnitine, extract, bitter orange, green tea extract, caffeine, fruit Garcinia cambogia, anti-caking agent - magnesium stearate, L-tyrosine, cayenne pepper, acidity regulator - citric acid extract from the fruit of black pepper chromium picolinate, the shell (gelatin, titanium dioxide pigment). Cena produktu jest zachęcająca ze względu na ilość porcji w opakowaniu. Ten suplement to dobry produkt dla osób zaczynających swoją przygodę ze spalaczami,ponieważ nie należy on do silnych spalaczy. Moim zdaniem organizm należy stopniowo przyzwyczajać. Dla osób,które brały mocniejsze suplementy produkt nie zadziała lub nie przyniesie zadawalających efektów. Trzeba jednak uważać na ilość przyjmowanej kofeiny. Zbyt duża dawka jest szkodliwa dla zdrowia! Bardzo intensywny zapach, który nie należy do najprzyjemniejszych. Sprawia, że połykanie tabletki za każdym razem przyprawia mnie o mdłości. W porównaniu do innych spalaczy, ten na prawdę "pali" ściany mojego żołądka, co bardzo często prowadzi do potrzeby zaprzestania ćwiczeń. Z efektami też nie ma szału, gdyż ich nie zauważyłam nawet po zużyciu 2/3 opakowania. Super! Sprawdza się, podczas treningu bardzo podniesiona termogenika organizmu, pot leje się strumieniami. Stosuję od niedawna (około 2 tygodnie) i widzę efekty. Oczywiście nie obejdzie się bez diety i sportu, tabletki wspomagają cały proces redukcji. Zachwycona produktem zamówiłam już kolejne opakowanie- póki można zakupić go okazyjnej cenie. Idealny spalacz na redukcję. Szału nie ma, ale przy zdrowej i wolnej redukcji jest idealny. Jestem w trakcie gubienia tłuszczyku i ten produkt pomaga mi w tym bardzo skutecznie! Prosty, ale skuteczny spalacz. Widzę różnicę już w połowie opakowania. Będę wracała do niego podczas każdego odchudzania. Sport Definition L-Carnitine [That's for Her] - 90 tabl. Trec Thermo Fat Burner MAX - 120 kaps. Thermo Fat Burner - is a special combination of thermogenic and lipotropic substances, which significantly accelerate fat reduction. Iron Horse Series Shape & Burn Xtreme is a product which supports fast burning an excessive amount of body fat. USN CLA Pure 1000 - 45 kaps. Mex Lipo Shred [Fit Line] - 120 tabl. Modern fat burner based on a complex blend of natural extracts, bio and micronutrients that work in a synergistic manner to facilitate and optimize each stage of the transport of fatty acids. It will help you in obtaining your dream, slim figure! It does not cause yo-yo effect! The product is characterized by a very good operation, after which they should reach athletes dreaming of a perfect silhouette. Thanks suplementowi get rid of unnecessary subcutaneous water, which only "takes place." Trec L-Carnitin 3000 - 60 kaps.